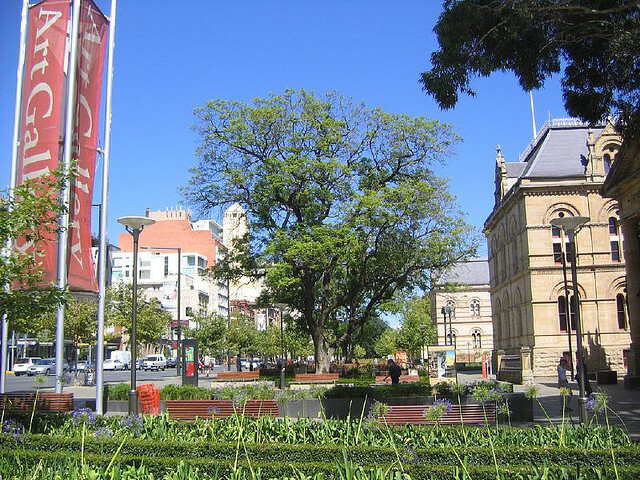 Adelaide is the capital of South Australia and the fifth largest city in Australia. Not the most typical destination for tourists considering�holidays to Australia, Adelaide is rich in culture and an excellent base for trips into the nearby wine regions, surf lessons on the Fleurieu Peninsula, hikes through the wildnerness of Kangaroo Island and native bushland in the Mt. Lofty Ranges. It’s home to world-renowned events, wines, cuisine, shopping and great people, so let’s go. 1. Botanic Gardens/ Botanic Bar/ Moonlight Cinema – The Botanic gardens of Adelaide are composed of three connected gardens which house plant life from around the globe. The gardens are an oasis and hub of the city center. Next to the gardens are the Botanic Bar, definitely one of the best places to grab a drink in Adelaide with it’s relaxed atmosphere situated in a historic building crawling with vines. The moonlight Cinema is an open air cinema screening latest releases, cult and classic movies on the lawns of the Park and shouldn’t be missed! 2. The Barossa Valley � with approximately 50 wineries in the region is the most famous wine region in South Australia. Surrounded by rolling countryside, quaint country gardens, take a scenic drive and indulge in one or several of the many wine-tasting tours at local cellars. Some famous brans include the Barossa Valley Estate Black Pepper Shiraz, Yalumba and Jacob’s Creek. 3. Adelaide Hills � Barely thirty minutes from the city center lie the Adelaide Hills, stretching from the Barossa Valley in the north, to Kuitpo Forest in the south. The countryside is gorgeous; dotted with quaint villages, cool-climate wineries and world class restaraunts. The famous big blue Australian skies stretch overhead with stunning views of the countryside below you. This area is great for driving and also for exploring by bicycle. 4. The Murray River – South Australia’s famous river offers an excellent day trip from Adelaide, take in sandstone cliffs, giant redgums and expansive wetlands. You can enjoy water skiing and canoeing or relax on a river boat cruise or better yet on a house boat! An alternative is to walk along the banks and take in the spectacular scenery. 5. Adelaide Central Market – The hub of gastronomic culture in Adelaide is sure to impress with eighty stalls under one roof offering fresh produce from local farmers and artisans. 6. Port Willunga – Another day trip from Adelaide, Port Willunga is a coastal village on the Fleurieu Peninsula, home to seaside restaraunts and ancient shipwrecks, most famously the remains of the Star of Greece, a three mast, iron cargo ship wrecked in 1888. Enjoy seafood fresh from the ocean; local squid and garfish being the most typical cuisine of the area. Go diving and snorkelling, exploring shipwrecks and marine life � look out for the famous Leafy Seadragon! More than anything, enjoy the laidback lifestyle of the Fleurieu Peninsula.